Lawrence improved to 2-0 with a 69-31 win over Shawnee Mission North on Thursday night. Senior quarterback Dante Jackson rushed for nearly 200 yards and four touchdowns, while passing for three more scores. Jackson took control of the Lions’ rushing attack after running back Hunter Krom left with an injury in the first quarter. Blue Valley earned its first victory with Allen Terrell as the head coach when the Tigers topped Blue Valley West 55-7. A week after suffering a lopsided loss to Bishop Miege in Week 1, Blue Valley jumped out to a 45-0 halftime lead on Friday against the Jaguars. Walker Kinney and Luke Bernard combined to complete 16 of 22 passes for 226 yards and three touchdowns. Garden City improved to 2-0 with a 16-7 win over a Colorado foe in Castle View. The Buffaloes’ defense still hasn’t allowed any points this season as Castle View’s lone touchdown came on a pick-six. Garden City opened the season with a 24-0 win over Wichita East. Quarterback Garret Doll passed for 133 yards, while rushing for 45 yards and a TD. Quinton Lapointe rushed for 170 yards and a touchdown. After barely beating Olathe East in Week 1, Hutchinson had an easier time during a 41-7 win over Newton. Salthawks fullback Joesiah Galindo finished with 132 yards and two touchdowns on 20 rushes. Wichita Northwest running back Breece Hall rushed for 210 yards and three touchdowns during a 37-20 win over Wichita Heights. Hall has rushed for 402 yards and four touchdowns on the season. Pittsburg improved to 2-0 with a 54-7 rout of Chanute. Chase Johnson picked off an early Blue Comet pass and returned it for a touchdown, but the story of the game was the Purple Dragon ground attack. Jhalani Long led the Dragons with 141 yards on the ground and two touchdowns, while quarterback Chase Curtis added three rushing scores. After putting up 39 pass attempts in a Week 1 win over Harrisonville (Mo. ), Curtis passed only seven times against Chanute. Pittsburg gets a big road test this week when the Purple Dragons make the short trip across the line to take on Missouri Class 4 No. 1 Webb City. Another week, another big performance from KC Schlagle’s Ivan Webb. After rushing for 348 yards and two scores in a Week 1 win over KC Southeast (Mo. ), Webb carried 35 times for 231 yards and three scores in the Stallions 38-28 win over KC Central (Mo.). Through two games, Webb has 579 rushing yards and five touchdowns. He looks to have a breakout season like Cornelius Ruff did for Schlagle a year ago. Ruff finished with 2,019 rushing yards and 27 touchdowns, but only had 402 yards through the first two games last season. Arkansas City scored touchdowns in the third quarter to hold off Salina Central 24-21. Junior quarterback Cevin Clark rushed for 130 yards and passed for 81 yards and a touchdown to lead the Bulldogs. Tyree Watkins added 58 yards rushing and two scores after his breakout Week 1 performance when he rushed for 228 yards and two scores in a loss to Haysville Campus. Salina Central was led by Taylon Peters’ 148 rushing yards and a touchdown on 21 carries. Shawnee Heights struggled with turnovers but remained unbeaten with a 28-0 win over Topeka West. The Thunderbirds turned the ball over five times in the game, but used a stout defense in holding the Chargers to 12 yards rushing and 85 total yards. Shawnee Heights rushed for 269 yards in the game led by Trey Jenkins’ 126 yards. Valley Center held off a Haysville Campus comeback 21-20 by stopping the Colt’s two-point conversion attempt with under a minute to go. Trailing 21-7 in the fourth quarter, Campus quarterback Fredrico Harvey led the Colts back by tossing a pair of touchdown passes to Tyler Kahmann. The second TD to Kahmann pulled the Colts within 21-20. Campus elected to go for the win, but Harvey was stopped just shy of the goal line give the Hornets the one-point win. Valley Center quarterback Parker Schrater passed for 103 yards and two touchdowns in playing for injured starter Wyatt Lange. Basehor-Linwood posted its second consecutive shutout with a 38-0 win over Spring Hill. Quarterback J.C. Watson passed for 125 yards and a touchdown, and rushed for 138 yards and two touchdowns. Kyle Alcanter picked off two passes for the Bobcat defense. Tonganoxie quarterback Mason Beach passed for 212 yards and a touchdown during a 35-7 win over Eudora. Caden Searcy caught four passes for 116 yards. The Chieftains improved to 2-0. Augusta opened the season with a 2-0 record for the third consecutive season, earning a 19-7 win over Clearwater. Chance Whitehead passed for 75 yards and two touchdowns, and rushed for 105 yards and a touchdown during the Orioles victory. Andale improved to 2-0 after a dominant 39-0 victory over the Labette County Grizzlies. Labette County scored 69 points in the previous week. Jeremy Jansen led Andale with 101 rushing yards and three touchdowns. Paola defeated Frontier League rival Baldwin for a third straight season. The Panthers scored 14 points in the second and third quarters to pull away for a 34-14 win. Kurt Golubski rushed for three touchdowns for the Panthers, while Drew Smith rushed for the other two scores. Baldwin scored on a touchdown pass from Luke Laskowski to Hunter Ramirez, and a Zach Flowers touchdown run. Santa Fe Trail grabbed the upper-hand in the Pioneer League standings with a 36-28 win over Burlington. The Wildcats tied the game at 28 mid-way through the third quarter on Connor Jeffers’ fourth touchdown run, but Santa Fe Trail came back with a long drive capped off by Will Herren’s third touchdown run with under three minutes to go. Herren rushed for 139 yards and three scores, while Jeffers led Burlington with 259 yards on the ground. Burlington was hurt by four turnovers. Clay Center picked up its first win of the season holding on for a 28-26 victory over NCKL rival Concordia. The Tigers trailed 14-6 at halftime, but used a 22-point third quarter to take a two-score lead. Concordia scored twice in the fourth quarter, but could not convert a two-point conversion. Senior Caleb Mendum led Clay Center with 104 yards rushing and two scores. Meanwhile, Anthony Enneking hauled in three receptions for 118 yards and two scores. 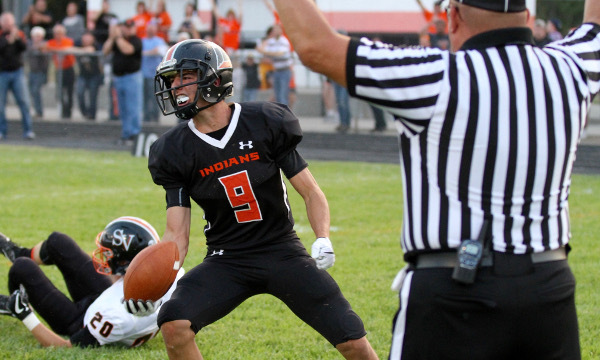 Larned evened its record at 1-1 with a 28-14 victory over Smoky Valley. The Indians led 21-6 at halftime and put the game away with a fourth quarter touchdown. Anthony McConnell scored three touchdowns for the Indians, while Mason Perez hauled in a touchdown pass from Carson Smith for the fourth score. Smoky Valley got a touchdown each from Cort Elliott and Riley Odell. After falling behind 6-0 to Hillsboro after one quarter, Kingman scored 20 unanswered to beat the Trojans 20-6. The Eagles rushed for 259 yards in the game led by William Milford (88 yards) and John Molitor (86 yards & a TD). Riley Krehbiel added 44 yards and a pair of touchdowns. Hugoton scored on a short touchdown run by Marcos Baeza mid-way through the fourth quarter to top Ulysses, 14-13. Ulysses led 7-6 at halftime and scored late in the third quarter to extend the lead to 13-6, but the PAT failed. Baeza’s touchdown pulled the Eagles to within 13-12, but Dawson Burnett converted the two-point attempt for the 14-13 lead. Burnett then sealed the game with a late interception. Chapman used a consistent run game and shutout Southeast of Saline in the second half to pull out a 28-20 victory. The Irish rushed for more than 400 yards in the game led by Malik Watkins’ 140-yard night. Southeast of Saline led 20-14 at halftime, but Watkins’ touchdown in the fourth quarter tied the game at 20. Izek Jackson then scored the go-ahead points on a short touchdown run and Dalton Harvey added the two-point conversion. The Irish picked up the first win for new coach Kurt Webster. Lakin delivered a big comeback to beat Meade, 30-28, in a Hi-Plains contest. Meade led 28-0 at halftime before Lakin tallied 24 points in the third quarter and six in the fourth to win. Third-year coach Chris Bamberger, who won a state title at Ness City, went 2-7 in his first season with the Broncs. Lakin is 7-5 since, including 2-0 this year. Dawsen Shalberg started the scoring with a 36-yard TD run. Hunter Kirby found Khai Hernandez for a 31-yard pass. Then, Juan Banuelos had a 13-yard pick-six. Lakin capped the comeback with an 11-yard TD pass from Kirby to Hernandez. This week, Lakin hosts Elkhart in a matchup of undefeated squads. Meade is 0-2. Senior quarterback Tristan Haynes, a Minneola transfer, led Meade with 6 of 12 passing for 18 yards and two scores against four interceptions. He tallied 26 carries for 120 yards and a TD. Lakin ended a seven-game losing streak against the Buffs. Norton rolled over Plainville, 40-10, in a home Mid-Continent League matchup. Senior quarterback Jace Ruder, a North Carolina commit, had 200 rushing yards and five scores on the ground. Senior Tevin Petrie delivered 138 rushing yards, including a 73-yard score. He had scores of 42, 3, 55 and 2 yards as Norton opened a 27-0 lead. Russell beat Sacred Heart, 49-7, in NCAA play. Austin Price scored with 30 seconds left in the first quarter for a 7-0 lead. Russell benefited from a pair of Sacred Heart turnovers to tack on two more touchdowns. Price threw a TD pass of 14 yards and had scoring runs of 87 and seven yards. The win ended a four-game losing streak versus the Knights, including losses by a combined 162-12 in the last three years. Hesston held off Halstead, 37-22, to earn the first win of the Tyson Bauerle era. Hesston rushed for 436 yards and five scores. Parker Roth had 24 carries for 265 yards and two TDs. Cameron Cox finished with 19 carries for 171 yards and two scores. He completed 13 of 19 passes for 105 yards. The Swathers had been 8-1 in the last nine contests in the rivalry before losing the last two years. Oskaloosa improved to 2-0 with a 36-14 win over Horton. The Bears’ lead was only 14-6 entering the fourth quarter, but Oskie outscored Horton 22-8 in the final stanza. Senior Jared Miller carried 27 times for 164 yards and a touchdown, while Hunter Reed added 123 rush yards and two touchdowns on only six attempts. Miller has now rushed for 364 yards and seven scores in Oskaloosa’s two wins. After Sedgwick opened with a 31-21 loss to Ell-Saline in Heart of America play, the Cardinals defeated Sterling by the same score. Junior Elijah Shrewsberry had a key fourth quarter interception to seal the win. Junior running back Colton Smith recorded 19 carries for 100 yards. Junior quarterback Hooper Schroeder completed 23 of 37 passes for 217 yards and three scores. All-state senior receiver Brayden Francis finished with 10 catches for 190 yards and two TDs, and senior linebacker Riley Bogunovich tallied 11 tackles (3 TFLs). Senior Neal Beaver has picked off three passes in two games. Sedgwick travels to Marion in a key league contest this week. Olpe defeated Caney Valley, 20-7, and ended the Bullpups’ eight-game winning regular season winning streak. Olpe won this game last year, 14-7, in a contest that ended at halftime. This year, sophomore Colby Hoelting played under center in place of injured Damon Schmidt. Caney VAlley scored on a 58-yard touchdown run early. Hoelting rushed for two touchdowns in the first half. Blaine Hinrichs added the final score in the first half on a 12-yard run. Elkhart defeated Southwestern Heights, 32-6. The Wildcats scored 20 points in the first quarter and six in the second quarter and led 26-0 at the break. Junior quarterback Lane Whisennand again delivered a huge performance with 20 carries for 217 yards and three scores. He completed 4 of 14 passing for 77 yards and one score against no interceptions. Elkhart limited SWH to 46 carries for 65 yards. Senior Joshua Salazar finished with 13 tackles and two catches for 70 yards and a score. Oakley captured the first win of the Jeff Hennick era with a 21-0 home victory against Sublette. In the last two years, the Plainsmen are 2-0 against Sublette, 0-9 against other teams. Oakley scored seven points in the second quarter and 14 in the third. Hill City defeated Stockton 64-18. Hill City led 14-0 after the first quarter and tallied 30 in the second quarter. The Ringnecks had three passing and two rushing scores from quarterback Ethan Hamel. He completed 14 of 21 passes for 260 yards and an interception. He rushed 10 times for 129 yards. Senior Garrett Handley finished with eight catches for 196 yards and a touchdown. Central Plains was preseason No. 1 in Division I but tumbled out of rankings following a big season-opening home loss to Victoria. The Oilers bounced back with a 44-20 victory against Ness City. The Oilers led 30-0 at halftime. Quarterback Myles Menges was 5 of 13 for 137 yards and two scores. Anthony Oberle paced the Oilers with 14 rushes for 110 yards. South Gray finished with three straight pick-sixes and pulled away for a 40-26 road win versus WaKeeney-Trego. The Rebels led 8-0 after the first quarter, 20-14 at halftime and 32-20 after three quarters. Rebel junior quarterback Austin Jantz completed 9 of 20 passes for 152 yards with a 2/1 TD/INT ratio. He rushed 29 times for 95 yards and a score. Seniors Jeremy Berg, Tyler Askew and Marcelo Neufeld recorded the pick-sixes. South Gray was one off the eight-man state record. The Rebels are now 2-0 after a season-opening 48-26 win against Ingalls. Hoxie defeated Lakeside-Downs, 46-0, with 22 points in the first quarter and 24 in the second. Hoxie limited the Knights, a ’16 district runner-up, to 24 plays for eight yards. Hoxie finished with 26 carries for 204 yards and four rushing scores. Junior quarterback Jared Kennedy completed 4 of 8 passes for 80 yards with a 2/1 TD/INT ratio. Hoxie is one of four eight-man teams that has not allowed a point this season. Atwood-Rawlins County defeated Sharon Springs-Wallace County, 46-0, the second straight season the Buffs have defeated the traditional powerhouse Wildcats. Atwood led 6-0 after the first quarter, 20-0 after the second and 40-0 after the third. Senior Maverick Green completed 5 of 11 passes for 92 yards with a touchdown and an interception. He rushed 15 times for 157 yards and four scores. Senior Braden Leitner recorded a receiving touchdown and a pick-six. Wallace County opened 0-2 last season before it finished 8-4. However, the Wildcats have not scored yet this season. Last year, West Elk defeated Oxford, an eventual district champion, in Week 2 and again in the first round of the playoffs. The Patriots earned a 56-6 victory this year. Senior Cade Miller completed 4 of 5 passes for 109 yards with a 2/0 TD/INT ratio. He rushed six times for 104 yards and a pair of TDs. West Elk returned two fumbles for scores en route to its tenth straight win versus Oxford. In a matchup of teams just outside the top-5, Division II Caldwell defeated Division I Argonia-Attica, 38-20. Caldwell won this contest for the second straight year after a 90-48 victory last fall. The Bluejays never trailed in the game. A&A narrowed the margin to 26-20 with 4:19 left, the first touchdown of the second half. However, Caldwell quickly responded when Corbin Rice completed a 42-yard pass to Justin Brown for a 32-20 lead. A&A fumbled, and Caldwell responded with an 18-yard touchdown from Rice to Brown. Caldwell held a 460-184 yardage edge. Rice finished with 11 of 20 passing for 196 yards and four scores. He rushed for 74 yards. Dakota Volavka tallied 187 rushing yards. Defending state runner-up Dighton delivered a 53-8 victory against Oberlin-Decatur Community and moved to 2-0. Dighton led 6-0 after the first quarter and 32-0 at halftime. The big difference came in passing. Oberlin held a 159-158 edge on the ground, but the Hornets had 143 passing yards to just 18 for Oberlin. Junior Blair Hoffman finished 7 of 11 passing for 143 yards with two scores against zero interceptions. Dighton picked off a pair of Oberlin passes. Senior Isaac Torson finished with 17 tackles (3 TFL). Mankato-Rock Hills won at Lincoln, 58-8. Rock Hills outscored the Leopards 24-8 in the first quarter before scoring six in the second, 22 in the third and six in the fourth. Sophomore Rylee Whelchel and junior Zane Colson combined for 23 carries for 296 rushing yards and six TDs. Veritas Christian scored in each quarter in beating Marais des Cygnes Valley, 36-8. The Eagles were led by Quinton Donohoe’s 175 passing yards and two touchdowns. Trey Huslig caught both touchdown passes and had 115 receiving yards. Veritas Christian and MdCV were scheduled to play Week 2 of last season, but the game was cancelled due to severe weather. Wichita Homeschool moved to 2-0 with a 50-28 win over Cair Paravel. The Warriors led 28-22 at halftime, but outscored the Lions 22-6 in the second half. Marshal Masterson passed for 208 yards and four touchdowns with two each going to Luke Johnson and Elliott Langhofer. Johnson also rushed for 168 yards and three scores in the win. Cheylin celebrated Homecoming with a 53-28 victory over Wheatland-Grinnell. The Cougars scored in every quarter, but shutout the Thunderhawks in the second half. Cheylin led 33-28 at halftime. Manuel Castillo led the Cougars with 205 rushing yards and three scores, while freshman Colton McCarty added 152 yards rushing and two touchdowns. Kyler Haffner passed for 174 yards and a score for Wheatland-Grinnell. The Weskan Coyotes extended their winning streak to 10 games with a 53-6 win over Natoma.The Tigers were led by Shayne Engling’s 49 yards rushing and a touchdown.